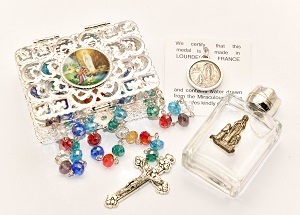 CATHOLIC GIFT SHOP LTD - Lourdes Water Pendant & Rosary Gift Set. Lourdes Water Pendant & Rosary Gift Set. > New larger apparition Lourdes silver water pendant 25 mm. > Silver rosary box depicting the apparitions at Lourdes. > Multicolour crystal Bernadette rosary necklace, the centerpiece depicts Bernadette praying and on the reverse is the apparitions, measures 20.5 inches long.